Slow cookers are usually thought of for fall and winter comfort foods–soups, stews, and pot roast. Now that it’s summer, we’re looking for the same ease and low-stress meal prep that the slow cooker allows but with a different menu. These Summer Slow Cooker Meals are my family’s favorites and easy enough for you to try anytime this season. With just 6 ingredients, this makes a full meal that’s satisfying and savory. If you prefer to make your own teriyaki sauce, it’s easy enough to do. 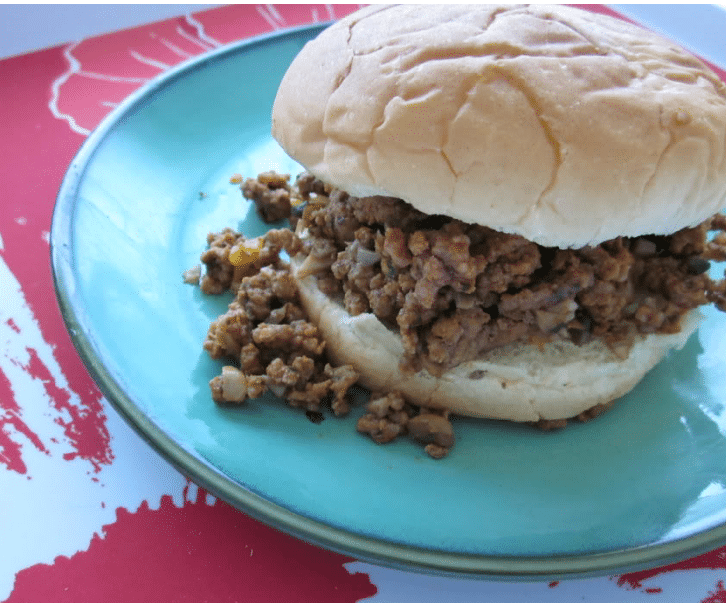 Sloppy joes are a kid fave, and they’re easy to load into the slow cooker when you’ve previously browned your ground beef or ground turkey and frozen it. This recipe calls for mushrooms and onions, but you can also add chopped peppers or zucchini for an extra veggie. This has become one of the most-requested meals at our house, especially by my husband. I love how easy it is, and it uses ingredients I often have on hand (like diced tomatoes), so it gets made often. 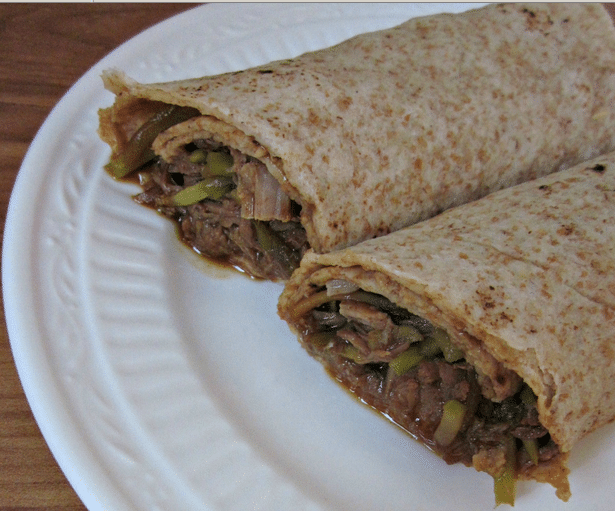 With just three ingredients, this Moo Shu is easy to pull together and easy to serve in either wheat or white tortillas as wraps. My famly just loves Greek flavors, so this is always enjoyed. Layer chicken breasts or thighs in the slow cooker, then cover with a can of diced tomatoes, a can of artichoke hearts, and a can of olives (my kids prefer black to green). Cook on low for 6-8 hours, then serve over rice, pasta or quinoa to sop up the juices. I usually sprinkle a little Feta cheese on top for a little tang. This is the recipe I pull out whenever we have company over the summer. It’s easy to double–or triple!–if needed, and it always comes out great. 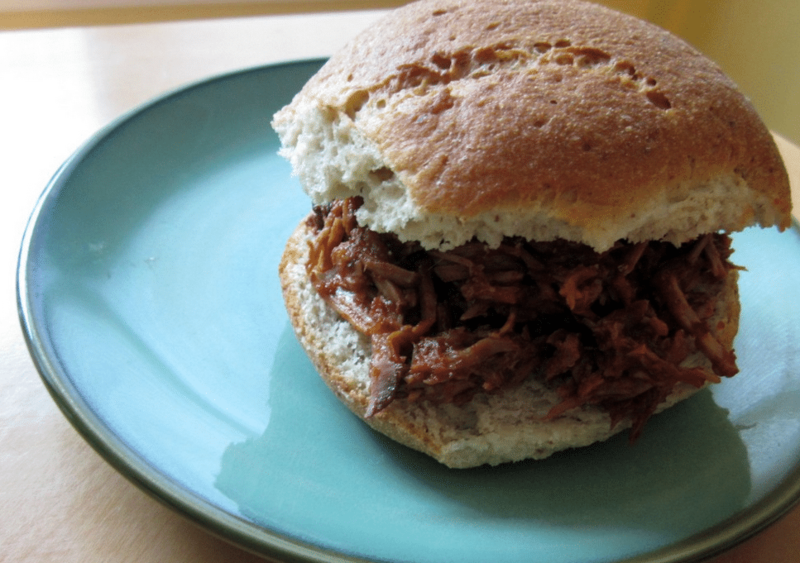 The sauce is a great mix of mustard and vinegar barbeque flavor, and it’s made from scratch. You could also just use a bottle of your favorite BBQ sauce. Sometimes we’ll do BBQ Chicken instead of pork. This is one of the most versatile “dump” recipes you’ll ever use: just combine chicken breasts or thighs with a jar of salsa (or salsa verde), or a can of diced tomatoes with green chiles. Cook on low for 6-8 hours, and then shred the chicken. It’s moist and delicious, which makes for great tacos served in flour tortillas with all the fixings. With the leftovers, I usually make quesadillas another day, or roll enchiladas to stick in the freezer. This Chicken Cacciatore recipe from Eat at Home includes a homemade sauce, but you can just use a jar if you don’t have the ingredients on hand. Serve over pasta for an easy meal. Instead of peppers and onions with an Italian sauce, change over to Mexican and make fajitas instead. Just layer strips of raw chicken breast with sliced onions and bell peppers in your slow cooker, add 2 teaspoons each of chili powder, cumin, paprika and garlic powder (in lieu of a Taco seasoning packet), and cook on low 6-7 hours. Serve in tortillas with salsa, sour cream, and other sides. 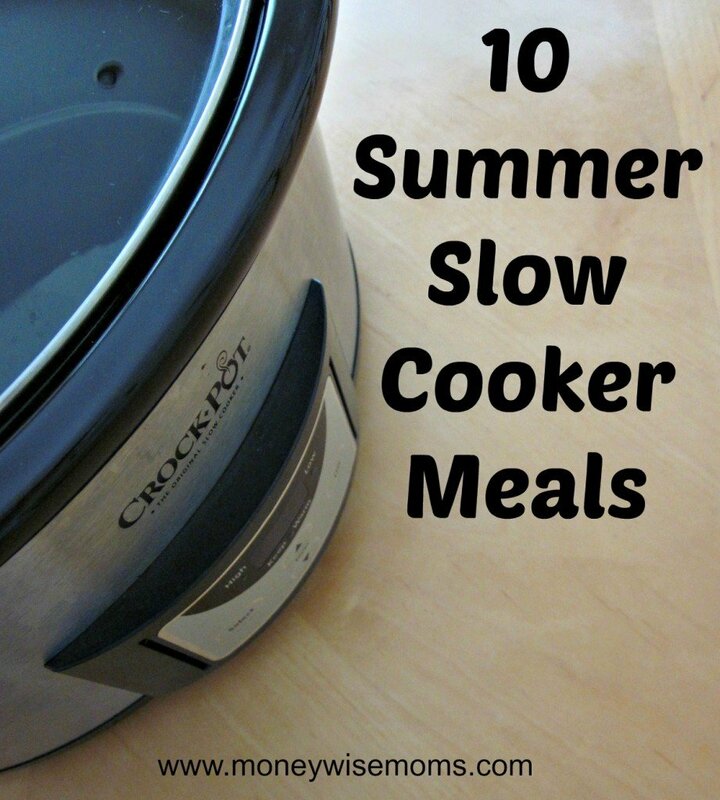 What are your favorite summer slow cooker meals? 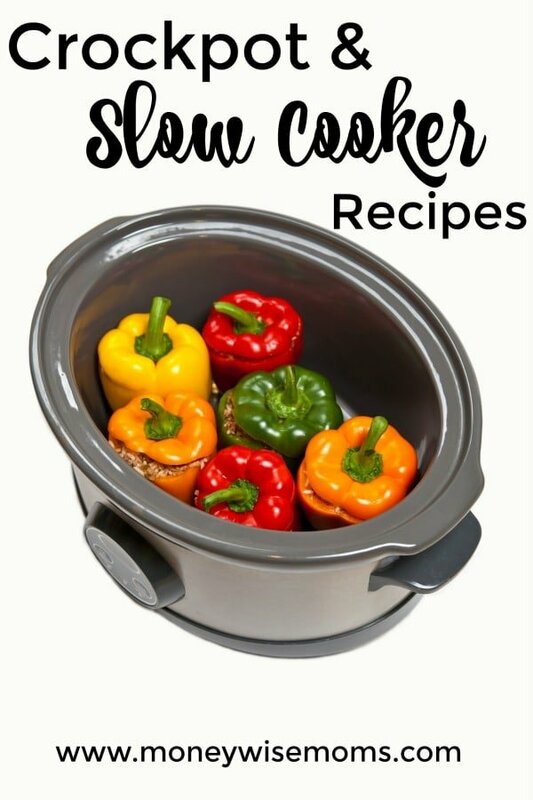 Looking for more slow cooker and crockpot recipes? 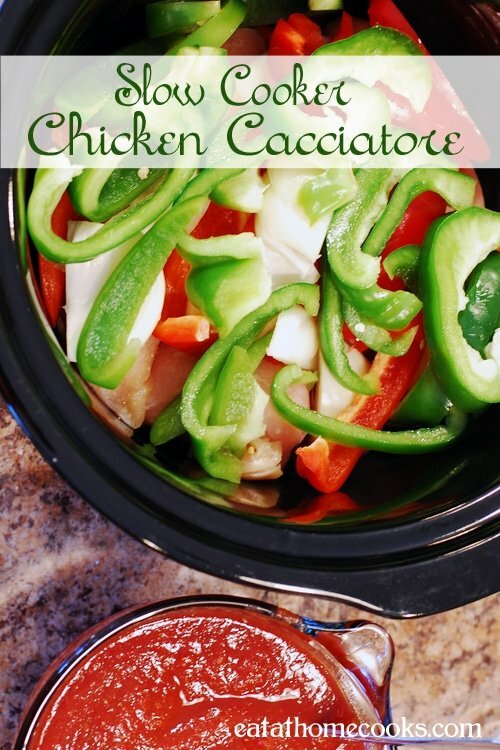 I love that u posted this…I am in need of tasty crockpot meals for summer. My one problem is that everytime I try chicken in the crockpot it turns out dry and really just not good. I’m using boneless chicken breasts and following recipes in regards to weight and time. What am I doing wrong? Can’t wait to try out these recipes! I had the same problem because slow cookers tend to heat really hot nowadays (compared to the pots made 30 yrs ago) so a recipe for low heat for 6-8 hrs should be more like low for 3-5. What I have found to work is using frozen chicken breasts. They tend to be moister and can stand to cook for longer. See if that helps. It’s delicious and makes enough for me to take a lunch to work every day! If desired, brown the chicken in hot oil; drain. Sprinkle generously with salt and pepper. 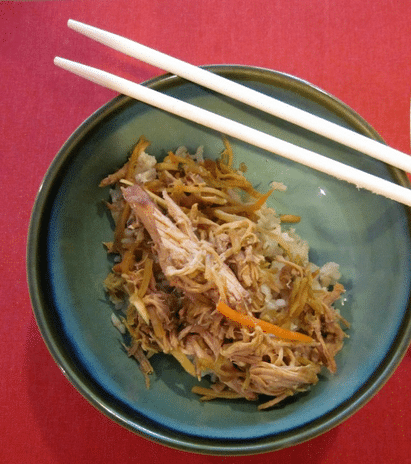 Arrange chicken in slow cooker. Combine tomato sauce, tomato paste, water, garlic, oregano and sugar; pour over the chicken. Cover and cook on LOW for 6 to 8 hours. Remove chicken and keep warm. Turn cooker to high heat setting, stir mozzarella cheese into sauce. Cook uncovered, till cheese melts and sauce is heated through. Serve chicken and sauce over hot cooked spaghetti. Serve with Parmesan cheese. Serves 6 to 8.
break noodles, place half of the noodles in bottom of greased slow cooker. Brown beef and drain. Stir Italian seasoning into meat and spread half of the cooked meat over the noodles in crock pot. Layer half of the sauce and water, half of the ricotta cheese, and half of mozzarella cheese over beef. Repeat layers. cover and cook on low heat 5 hours. For this recipe, I just used chicken thighs, along with marsala wine and Progresso’s Recipe Starters in Creamy Portabella Mushroom. This cooking sauce gave my slow cooker chicken marsala the most wonderful flavor and lots of rich creaminess. You can serve this chicken over pasta, but I choose white rice, mainly because it’s so easy to cook in my rice cooker. I just kept my rice warm in the cooker sitting by the rice cooker. It was a great dinner to serve my family.